We are overlooking the Complex 22 "softsite". The launch area is the large concrete pad in the background of the photo. The objects standing on the launch area had nothing to do with launches from this Complex; they are just temporarily being stored there. 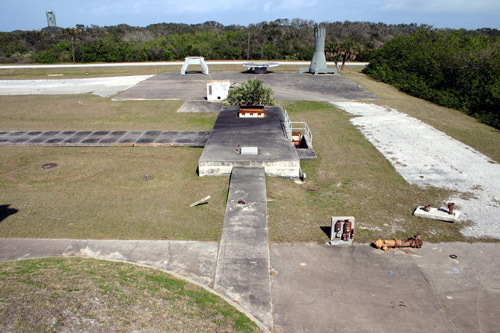 Along with Complex 21, this Complex was built to support launches of the Air Force Mace and Bull Goose missiles. The first launch took place from this site on March 13, 1957. After the 23rd and final launch on June 24, 1960, this Complex was moved to inactive status. The rectangular enclosure in the center of the photo housed equipment used for launch and checkout.